High-cost production of bioplastics polyhydroxyalkanoates (PHA) is a major concern for their large scale application. In order to produce PHA economically, new technology must be developed to reduce costs on energy consumption, fresh water and substrate usages. It is also important to conduct the PHA production process in a continuous way rather than in a batch process. A halophile Halomonas campaniensis strain LS21 was isolated to allow the development of a sea water based open and continuous process for PHA production utilizing mixed substrates consisting of mostly cellulose, starch, lipids and proteins. To study the feasibilities of open and long-term cultivation as well as genetic manipulation of this strain, polyhydroxybutyrate (PHB), the first member of the diverse PHA family, was taken as an example for the application of H. campaniensis LS21 in a robust and long lasting fermentation process. Wild type and recombinant H. campaniensis LS21 containing a PHB synthesis genes phbCAB were allowed respectively to grow in artificial seawater containing mixed substrates similar to kitchen wastes, including soluble and insoluble cellulose, proteins, fats, fatty acids and starch for 65 days without interruption. In the presence of 27 g/L NaCl under a pH around 10 at 37°C, the recombinant produced approximately 70% PHB and the wild type 26% during the 65 days fermentation process without infection. H. campaniensis LS21 secreted extracellular amylase, lipase, protease and cellulase simultaneously during the whole process to allow consumption of the mixed substrates. The recombinant was also found to stably maintain the phbCAB plasmid over the entire 65 days process. The seawater based open and continuous process based on halophilic Halomonas campaniensis LS21 allowed the applications of kitchen wastes like mixed substrates as nutrients for production of bioplastic PHB. This study demonstrates the advantages of this technology in terms of energy saving (non-sterilization), seawater based (not fresh water needed), long-lasting and continuous open processing (against batch process), and low cost substrates (non-food mixed substrates). Combined with its ease of genetic manipulation, Halomonas campaniensis LS21 could be developed into a platform for low cost production of chemicals, materials and biofuels. Industrial biotechnology aims to produce chemicals, materials and biofuels on a large scale using sustainable resources from agriculture [1–3]. By partially replacing depleting petrochemicals, industrial biotechnology should help sustainable development of human society [4–9]. However, most microbial-based industrial biotechnology processes are not competitive enough as they suffer many disadvantages, including high energy-demand due to energy-intensive sterilization processes, heavy consumption of precious fresh water, and batch or fed-batch processing against continuous processes in petrochemical industries. In addition, large-scale production of industrial biotechnology products always consumes a large quantity of agricultural resources, causing some concerns such as food versus fuels et cetera [10–12]. Therefore, it becomes important to develop competitive industrial biotechnology based on energy saving, continuous processing, non-fresh water and non-food substrate consuming processes. Such new technology will allow industrial biotechnology to coexist with chemical industries for supplying chemicals, materials and fuels to a sustainable human society. Halophile bacteria are able to grow in NaCl. Seawater is rich on NaCl and it is suitable for halophilic bacteria to grow. Most importantly, 97% of water on Earth is seawater . With this in mind, it becomes necessary to isolate halophile bacteria that are able to grow rapidly in seawater, utilizing low-cost substrates such as cellulose, starch or kitchen waste. If such bacteria are obtained, a continuous fermentation process should be exploited for reducing process complexity and lowering production cost. Polyhydroxyalkanoates (PHA) are the most versatile bioplastics with properties similar to petroleum-based plastics [14, 15]. As a family of biodegradable and biocompatible polyesters, PHA could be developed as environmentally friendly bulk plastics, provided the production cost is competitive [16, 17]. Common PHA monomers are 3-hydroxybutyrate (3HB or C4), 3-hydroxyvalerate (3HV or C5), 3-hydroxyhexanoate (3HHx or C6), 3-hydroxyoctanoate (3HO or C8), 3-hydroxydecanoate (3HD or C10) and 3-hydroxydodecanoate (3HDD or C12) . These monomers form their homo- or copolymers. Poly(3-hydroxybutyrate) (PHB), Its 4-hydroxybutyrate copolymers P3HB4HB and poly(3-hydroxybutyrate–co-3-hydroxyvalerate) (PHBV) have been well-investigated and also commercialized, yet with limited success due to high production cost . It thus becomes important to develop cost-saving biotechnology for PHA production. As many halophile bacteria can produce PHA [19, 20], they could provide a new solution for low-cost PHA production [21–23]. Therefore, PHA production by halophile bacteria can be a convenient example to demonstrate the possibility of a seawater-based continuous fermentation process for competitive industrial biotechnology. This study aims to isolate a halophile bacterium capable of growing in seawater, utilizing kitchen waste such as mixed substrates. At the same time, as most halophile bacteria are also alkali, a combination of halophile and alkali properties provides a natural anti-infection ability for halophile bacteria, allowing a possible open (unsterile) and continuous fermentation process to occur. If such a halophile bacterium could be found, a convenient example to show its feasibility for industrial biotechnology purposes would be its PHA (or PHB) production. In addition, the halophile bacterium should be allowed to conduct genetic manipulation for production of a wide range of products. The success of this study depends very much on finding a halophile bacterium that is able to grow in seawater at a high pH, utilizing low-value substrates such as cellulose, proteins, starch, fat or fatty acids, or ideally mixtures of these, which are mostly found in kitchen waste. If this halophile and alkali bacterium is isolated, we would be able to develop an unsterile (open) and continuous fermentation process using seawater and mixed substrates for long-lasting production of chemicals, materials or biofuels. Very importantly, the strain should allow genetic manipulations to widen its abilities. To test the above expectations, PHB, a bulk biodegradable plastic, is taken as a convenient example to demonstrate the feasibility of this project. Among thousands of halophile bacteria isolated from the environmental samples collected from Xinjiang China, five of them were found capable of utilizing cellulose as a sole substrate for accumulating PHB. The five strains were further tested for ability to grow on mixed substrates of cellulose, proteins, fat and starch. Only one strain, termed LS21, demonstrated its ability to utilize the above substrates separately or collectively. Strain LS21 was thus chosen for further study, not only due to its mixed substrate utilization ability, but also its rapid growth and PHB accumulation. Strain LS21 grows well in cellulose medium containing 1 to 20% (w/v) NaCl, indicating it to be a moderate halophile. The optimum NaCl concentration and temperature for strain LS21 was found to be 4 to 6% (w/v) and 42°C, respectively. No growth was observed below 20°C and above 55°C. The strain grew well in pH ranging from 5.0 to 11.0, the optimum of which was 10.0. The sequence of 16S rRNA gene of strain LS21 was compared with all 16S rRNA encoding gene sequences available in GenBank using the BLAST program, results showed that strain LS21 belongs to Halomonas campaniensis (Figure 1A). It is therefore termed Halomonas campaniensis LS21 or H. campaniensis LS21 throughout this study. Based on the BIOLOG experiments result, strain LS21 is urease, oxidase and catalase positive, it hydrolyzes hippurate, Tween 80 and tyrosine, reduces nitrate casein and starch, but is unable to hydrolyze gelatin and phenylalanine. Strain LS21 is unable to grow in medium containing galactose as the only carbon source, whereas sucrose, maltose, cellubiose, mannose, sodium acetate, fructose, glucose and glycerol sustain its growth, respectively. Analysis (16S rRNA) reveals that its sequence shares 100% similarity to strain Halomonas campaniensis 5AGT [GenBank accession number: AJ515365]. Compared strain LS21 with Halomonas campaniensis 5AGT, two strains exhibit similarities in their phenotypes and physiology. The Accession number of the reference strains of the 16S rDNA sequence are provided (Figure 1A, within the parentheses after the strains name). Polyhydroxybutyrate (PHB) synthesis and phylogenetic relationship of Halomonas campaniensis LS21 with other Halomonas spp. (A) Phylogenetic relationship of Halomonas campaniensis LS21 with other Halomonas spp. constructed by the neighbor-joining algorithms method based on 16S rRNA gene sequences. GenBank/EMBL/DDBJ accession numbers are indicated in the parentheses after the strain names. The bar indicates 1% sequence divergence. Halomonas campaniensis LS21 is labeled with red color (Please see Figure 1A, bottom right, the 6th strain name, labeled with red color). Recombinant H. campaniensis LS21 synthesizes one or two large PHB granules when glucose is supplied as sole carbon source (B and C). When grown in glucose mineral medium, both wild-type and recombinant H. campaniensis LS21 was found to accumulate only one large PHB granule (Figures 1B and 1C), a phenomenon never observed previously in any wild-type PHB-synthesizing bacteria. Yet this large single PHB granule is convenient for downstream PHB extraction as a large PHB granule size permits an easy centrifugation process due to its relative heavy weight compared with smaller and multiple PHB (PHA) granules commonly found in all other PHA accumulation bacteria [24, 25]. H. campaniensis LS21 was identified to be a suitable strain for developing the seawater-based open and continuous process for bulk chemical production utilizing mixed substrates. The next step was the establishment of genetic manipulation methods for increasing the strain’s ability. 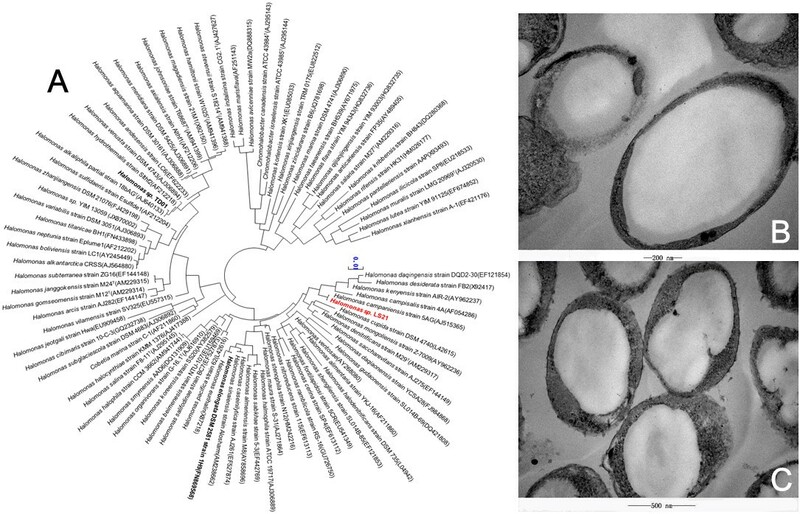 Therefore, we started by screening a native and strong promoter from H. campaniensis LS21. When grown under different culture conditions, including cellulose, starch, proteins, fatty acids and LB media (10 g/L tryptone, 5 g/L yeast extract, and 40 g/L NaCl), respectively, SDS-PAGE analyses on total proteins extracted from the above cultures all showed a very strong band of proteins with a size of approximately 34 KD (Figure 2). The band was revealed to contain 879 types of proteins with similar molecular weights based on the results of protein mass spectra, including methylisocitrate lyase (32.6 KD), Gram-negative bacterial pore protein porin (39.4 KD), transketolase (35.6 KD), and malate dehydrogenase (34.8 KD) as the most abundant proteins. Among this group of similar-size proteins, the porin protein had the highest abundance. This result agrees with others who reported strong constitutively expressed proteins in Halomonas spp . SDS-PAGE analysis of total proteins from wild-type Halomonas campaniensis LS21. Lane M is the protein maker. Lanes 1 to 4 are bacterial proteins extracted from H. campaniensis LS21 grown in cellulose, starch, fatty acids and LB media (10 g/L tryptone, 5 g/L yeast extract, and 40 g/L NaCl), respectively. A 34-KD-size strong protein band was observed under all conditions (Indicated by the arrow). Two genes encoding porin proteins were identified in the genome of H. campaniensis LS21 with gene ID HalomonasGL003735 and HalomonasGL001529, respectively. They have a sequence homology of 91%. There are 859 bp and 577 bp distances between HalomonasGL003735 and HalomonasGL001529 and their respective front coding genes according to the promoter predicting software, namely, the Promoter2.0. The software predicted upstream of porin gene HalomonasGL001529 contains multiple promoter sequences. Therefore, the entire upstream sequence of porin gene HalomonasGL001529 was selected as a candidate promoter for this study. 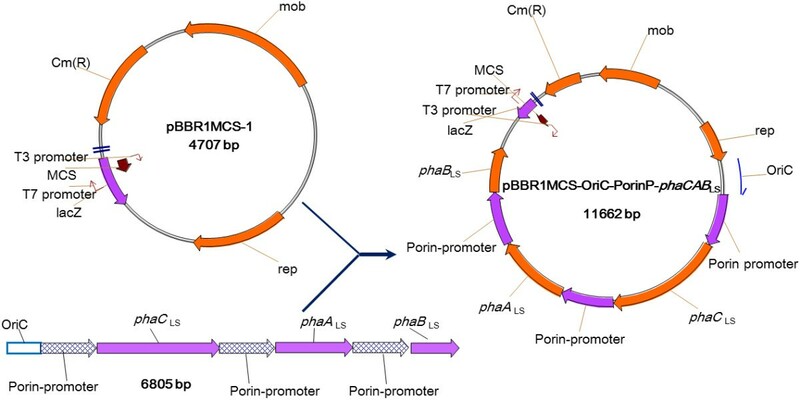 Plasmid pBBR1MCS1-OriC-Pporin-phaCABLS was constructed as clearly described in Methods. To improve the PHA synthesis ability of H. campaniensis LS21, the plasmid was constructed containing PHB synthesis genes cloned from LS21 including genes of PHA synthase phaC, β-ketothiolase phaA, nicotinamide adenine dinucleotide phosphate-oxidase (NADPH)-dependent acetoacetyl-CoA reductase phaB, each under a strong porin promoter. It also has an origin of replication OriC from the host chromosome (Figure 1). The pBBR1MCS1-OriC-Pporin-phaCABLS was first transformed into Escherichia coli S17-1 via electroporation. Conjugation between the above recombinant E. coli S17-1 to H. campaniensis LS21 allowed the plasmid to enter H. campaniensis LS21 successfully. Wild-type and recombinant H. campaniensis LS21 were grown in glucose mineral (MMG) medium and mixed substrates medium, respectively. When growth in MMG over a period of 48 h, the wild-type and recombinant cells produced a cell dry weight (CDW) of 8.2 g/L containing 57% PHB and 7.8 g/L containing 83% PHB, respectively. The slow growth of the recombinant was attributed to the presence of chloromycetin (25 mg/L) which was used to maintain the stability of the plasmid. Obviously, the recombinant accumulated much more PHB compared with the wild type due to the presence of additional PHB synthesis genes (Figure 3). Shake flask study of growth and polyhydroxybutyrate (PHB) production by wild-type and recombinant H. campaniensis LS21 grown on glucose mineral medium and mixed substrates medium, respectively. (A) Growth in glucose mineral medium for 48 h. (B) Growth in mixed substrates medium for 72 h.
In contrast, when grown in mixed substrates medium over a period of 72 h, the wild-type and the recombinant strains produced a cell dry weight of 4.8 g/L containing 19% PHB and 4.4 g/L containing 63% PHB, respectively. The growth in mixed substrates was slower compared with that in the MMG. This must be due to the energy the bacteria consumed to produce extracellular hydrolytic enzymes, which hydrolyzed the large molecule substrates for uptake as nutrients. In both cases, the recombinant strain accumulated significantly more PHB than that of the wild-type strain. This confirmed that H. campaniensis LS21 can be genetically manipulated to add more possibilities to the strain. Wild-type and recombinant H. campaniensis LS21 were grown in mixed substrates composed of straw cellulose extract liquid 200 ml/L (approximately 0.5 g/L cellulose),microcrystalline cellulose 2 g/L, oleic acid 40 ml/L, animal fat (lard) 5 g/L, soluble starch 25 g/L, soya protein 2.5 g/L and casein 2.5 g/L. This composition is similar to many kitchen food wastes. Unlike in shake flasks, wild-type and recombinant cells grew similarly in fermentors with their CDW reaching the maximum on the day 10 at 73 g/L and on the day 12 at 69 g/L, respectively (Figure 4).Due to the exhaustion of mixed substrates, especially starch, in both cultures (Figure 5), CDW began to decline for both strains. On days 25 and 49, fresh mixed substrates were added to both cultures, respectively, and cell growth resumed. PHB accumulation seemed to be associated with cell growth for both wild-type and recombinant cells. In all cases, cell growth and PHB production fluctuated with the availability of starch. Interestingly, amylase activity showed a trend to increase, regardless of the availability of starch (Figure 5A). Both strains consumed fatty acid (oleic acid), proteins and cellulose but were more sensitive to starch than other substrates. Growth and polyhydroxybutyrate (PHB) production by recombinant and wild-type H. campaniensis LS21 fed with mixed substrates over a period of 65 days under unsterile and continuous conditions. (A) Productions of cell dry weights (CDW) and PHB by wild-type and recombinant H. campaniensis LS21 grown in mixed substrates over a period of 65 days under unsterile and continuous conditions. (B) Both wild-type and recombinant H. campaniensis LS21 maintained a relatively stable pH during different phases of growth without automatic pH adjustments. (C) Results of PCR assays for wild-type and recombinant H. campaniensis LS21 cultures from their respective unsterilized fermentations on day 65. The primers were designed based on the conserved sequences of H. campaniensis LS21. Eleven colonies were randomly selected from Petri disks on day-65 cultures, respectively, for the PCR assays. M: marker, lanes 1 to 11: culture of recombinant H. campaniensis LS21 as the PCR template; lanes 12 to 22: culture of wild-type H. campaniensis LS21 as the PCR template. Production of extracellular enzyme activities by recombinant and wild-type H. campaniensis LS21 grown in mixed substrates over a period of 65 days under unsterile and continuous feeding conditions. (A) Relationship of starch consumption and amylase activity formation. (B) Relationship of fatty acid consumption and lipase formation. (C) Relationship of protein consumption and protease formation. (D) Relationship of cellulose consumption and cellulase activity formation. Although both strains grew similarly, recombinant cells produced far more PHB than the wild-type strain, reaching around 70% for recombinant and only 30% for the wild type, demonstrating the stable and strong expression of the PHB synthesis genes by the recombinant H. campaniensis LS21. Interestingly, consumption of mixed substrates and formations of amylase, protease and cellulose were always the same for both strains. 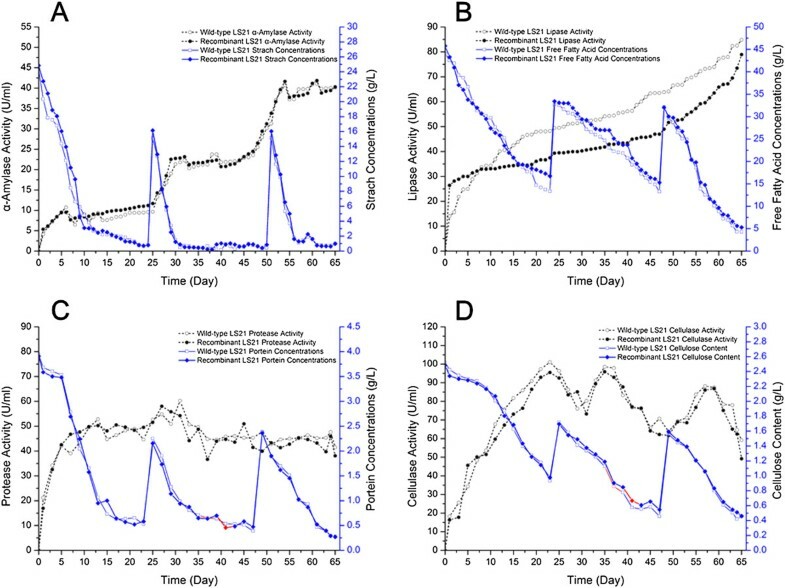 Remarkably, the wild-type exhibited significantly more lipase activity than the recombinant strain (Figure 5B), resulting in slightly faster fatty acid consumption than the recombinant strain. In contrast to soluble starch, the mixed substrate medium contained two insoluble components including oleic acid and animal fat (lard). These are more difficult to utilize than starch. The utilization rate of oleic acid and lard by recombinant H. campaniensis LS21 was slower than by the wild type (Figure 5B). The concentration of fatty acids decreased to 13 g/L (wild-type strain) and 17 g/L (recombinant strain) from initially 45 g/L. The rate of fatty acid consumption was 1.32 g/L d−1 and 1.17 g/L d−1, respectively. After the second feeding, the two fermentation systems consumed 32.6 g/L to 13.2 g/L (wild-type strain) and 33.4 g/L to 15.2 g/L (recombinant strain), respectively. The third feeding led to the highest free fatty acid consumption rate during the growth, which was 1.56 g/L d−1 and 1.48 g/L d−1, respectively. Similar to the amylase activity change, lipase activity kept increasing during the entire fermentation process (Figure 5B). We used 4 g/L proteins including 2 g/L plant soy protein and 2 g/L animal casein to imitate soluble and insoluble proteins in food waste. Recombinant and wild-type strains consumed 4 g/L proteins to around 0.6 g/L on day 17 of the fermentation. Protease activities produced by both strains were maintained relatively stable despite the fluctuation of the protein concentrations (Figure 5C). Cellulose was consumed most slowly among the four substrates. Unlike amylase, protease and lipase, cellulase appeared to be sensitive to the availability and concentration of celluose, and decreasing cellulose concentration led to reduced cellulase activity (Figure 5D). The ability of recombinant H. campaniensis LS21 to consume mixed macromolecular substrates via the production of extracellular multiple hydrolytic enzymes is an obvious advantage of this strain for industrial biotechnology purpose. Even after switching off of the automatic pH adjustment, both wild-type and recombinant H. campaniensis LS21 maintained a relatively stable pH during different phases of growth (Figure 4B). This was due to the mixed substrates consisting of small and larger molecules of different properties, including glucose, amino acids, fatty acids and oligomers of glucose, and amino acids as well as a mixture of the four large molecules, which can provide a buffering effect for the microbial growth system. Amazingly, results of PCR assays for wild-type and recombinant H. campaniensis LS21 cultures from their respective unsterilized fermentation showed an infection-free phenomenon after the long-lasting 65-day-growth, even though unsterile mixed substrates were fed twice under such robust conditions (Figure 4C), this is almost an ideal situation for any fermentation process engineer. Plasmid stability is also important for large-scale and long-lasting industrial processes. Analysis of plasmid stability based on PCR assays showed that recombinant H. campaniensis LS21 grown under an unsterile and continuous process for 65 days still maintained most their plasmids (Figure 6). On day 65 at the end of the fermentation, 63% of recombinant H. campaniensis LS21 cells still maintained their plasmids. Analysis of plasmid stability based on PCR assays of recombinant H. campaniensis LS21 grown under unsterile and continuous process for 65 days. M: marker; lanes 1 to 24: 24 colonies were randomly selected from Petri disks grown with the day-65 recombinant H. campaniensis LS21 for the PCR assays. The primers were designed based on the conserved sequence of the backbone plasmid pBBRMCS1 with a target product of 1278 bp. A seawater-based open and continuous process based on Halomonas campaniensis LS21 and mixed substrates was developed. It was successfully applied to produce bulk bioplastic PHB. H. campaniensis LS21 was easily constructed into a recombinant that was able to overexpress its native PHB synthesis genes with its own strong porin promoter, resulting in significant enhancement of PHB accumulation. The process was maintained infection-free under open and feeding conditions for at least 65 days, demonstrating its rare robustness. The ability of H. campaniensis LS21 to simultaneously consume several kitchen-waste-like substrates allows industrial biotechnology to avoid the fuel-versus-food issue. Further genetic manipulation should provide a wide range of products to be produced by this process in an economic competitive way. Sludge and plant debris samples were collected from Dabancheng salt lake in Xinjiang, China. All samples were suspended with 1% (w/v) NaCl aqeuous solution; 1 ml suspension was inoculated into a modified LB medium containing 40 g/L NaCl at pH 10.0 with 2% agar (40-LB) for first-round isolation of halophile strains. Subsequently, the first-round isolates were inoculated on Petri plates for screening of halophile and cellulolytic strains. The solid plate medium consists of 3 g/L microcrystalline soluble cellulose powder (Sigma-Aldrich, Saint Louis, MO, USA) as the sole carbon source, together with per liter 1.5 g agar and 100 ml of a mineral salt solution containing 0.1% NH4Cl, 0.2% MgSO4, 0.12% K2HPO4 (Sinopharm Chemical Reagent Co., Ltd, Shanghai, China). The medium was adjusted to pH 10 with 5 M NaOH aqueous solution. Plates were incubated at 37°C for approximately 48 h. The colony forming units (CFU) that were well-separated were then isolated and purified. One large bacterial isolate with the most rapid growth rate was selected for further characterization. Genomic DNA of the selected strain was purified using EZNA Bacterial DNA Kit (Omega, USA). Then the 16S rRNA gene sequence of the selected strain was determined by sequencing of the PCR-amplified 16S rDNA. The 16S rDNA was amplified by PCR using standard protocols based on the forward primer-16 F (positions 8 to 27 of the E. coli numbering, 5’-GAGTTTGATCCTGGCTCAG-3’) and reverse primer-16R (positions 1512–1493, 5’-ACGGCTACCTTGTTACGACT-3’) . The PCR product was purified by EZNA Gel Extraction Kit (TIANGEN, China). Sequencing of 16S rDNA was carried out by BGI (Shenzhen, China). A homology search of the databases was performed using the BLAST program (http://www.ncbi.nlm.nih.gov/BLAST). The phylogenetic tree of 16S rDNA was constructed using the neighbor-joining method with MEGA 5.2 software package. To obtain total bacterial proteins, H. campaniensis LS21 was grown to about 1.8 at optical density (OD)600, the cells were harvested by centrifugation at 4,000 g for 15 minutes at 4°C from LB liquid medium culture. These cells were re-suspended in 1 ml Tris-HCl (pH = 8.0), followed by sonication to lyse the cells under ice-cold conditions. The suspension of the lysed cells was centrifuged at 10,000 g for 15 minutes at 4°C to obtain a clear supernatant collected in a clean and sterilized 1.5-ml EP tube. The protein concentrations were studied using bicinchoninic acid (BCA) protein assay . To quantify the target protein under different substrate conditions, samples were separated on 1 D SDS-PAGE. 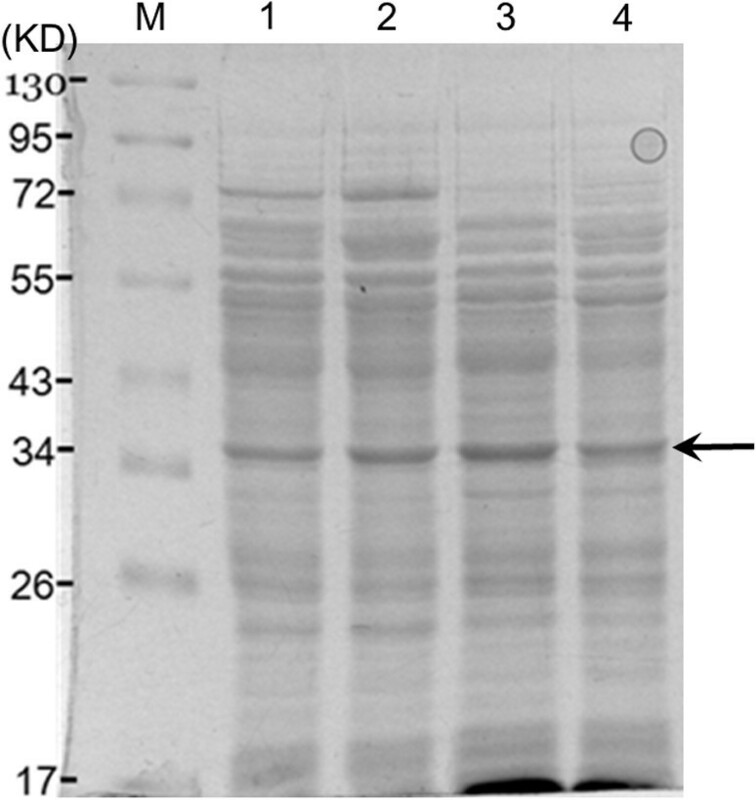 The gel bands corresponding to the targeted proteins were excised from the gel, subsequently reduced with 25 mM DTT and alkylated with 55 mM iodoacetamide . In-gel digestion was carried out using the sequence-grade-modified trypsin (Promega, Fitchburg, WI, USA) in 50 mM disodium hydrogen phosphate at 37°C overnight. The peptides were extracted twice with 1% trifluroacetic acid in 50% acetonitrile aqueous solution for 30 minutes. The extracts were then centrifuged to reduce the volume. Peptides from different samples were labeled with tandem mass tags (TMT) reagents (Thermo, Pierce Biotechnology, USA) according to the manufacturer’s instruction. Briefly, the TMT reagents were dissolved in acetonitrile and added to the peptides carefully. The reaction was maintained at room temperature for 1 h, and quenched with 5% hydroxylamine for 15 minutes. The TMT-labeled peptides were mixed and desalted by stage tips. To conduct liquid chromatography-tandem mass spectrometry (LC-MS/MS) analysis, the TMT-labeled peptides were separated by a 60-minute gradient elution at a flow rate of 0.25 μl/minute with an EASY-nLCII™ integrated nano-high performance liquid chromatography (HPLC) system (Proxeon, Denmark), which is directly interfaced with a Q exactive mass spectrometer (Thermo Scientific, USA). The analytical column was a fused silica capillary column packed with C18 resin with a dimension of 75 μm ID and 150 mm in length. Mobile phases and A and B consisted of 0.1% formic acid and 100% acetonitrile in 0.1% formic acid, respectively. The Q exactive mass spectrometerwas operated in a data-dependent acquisition mode using the Xcalibur 2.1.3 software. There was a single full-scan mass spectrum in the Orbitrap (400 to 1,800 m/z, 30,000 resolution) followed by 10 MS/MS scans in the quadrupole collision cell using the higher-energy collision dissociation. The MS/MS spectra from each LC-MS/MS run were searched against the selected database using the Proteome Discovery searching engine. The searching parameters are listed below: peptides ms tolerance of 20 ppm; ms/ms tolerance of 20 mmu; carbamidomethylation of Cys, TMT of lysine and peptide N terminal as the fixed modification, oxidation on Met as the variable modification. Peptides with high confidences were used for protein identification. MS/MS spectra for all matched peptides were manually interpreted and confirmed. To improve the stability of the plasmid and the efficiency of target gene expression in the bacteria , the native chromosomal DNA replication origin (OriC) in H. campaniensis LS21 genome was screened for plasmid construction. Ori-Finder (http://tubic.tju.edu.cn/Ori-Finder), an online system, has been used for finding oriC H. campaniensis LS21 genome (with the kind assistance from Professor Zhang Chunting and Dr Gao Feng of Tianjin University, China), which is based on an integrated method comprising the analysis of base composition asymmetry using the Z-curve method, distribution of DnaA boxes, and the occurrence of genes frequently close to OriC. To improve the PHA synthesis ability of H. campaniensis LS21, an overexpression plasmid of PHA synthesis genes containing genes of PHA synthase phaC, β-ketothioelase phaA, NADPH-dependent acetoacetyl-CoA reductase phaB was constructed. The plasmid consists of a porin promoter and an OriC from the host chromosome (Figure 7). In detail, the expression vector pBBR1MCS1-OriC-Pporin-phaCABLS applicable in H. campaniensis LS21, was constructed by ligating OriC replica and the promoter of an outer membrane pole protein termed porin of H. campaniensis LS21, which was obtained from the process of promoter screening by quantitative proteomic analysis. Strains and plasmids used in this study listed in Table 1. Construction of polyhydroxybutyrate (PHB) synthesis plasmid under a strong porin promoter. Plasmid pBBRMCS1 serves as backbone of expression vector pBBR1MCS-OriC-PorinP-phaCABLS. It consists of Halomonas campaniensis LS21 PHB synthesis operon including genes encoding PHA synthase phaC, β-ketothiolase phaA, NADPH-dependent acetoacetyl-CoA reductase phaB. The operon is under the control of a strong porin promoter and an oriC from the host chromosome. pBBR1-MCS1 derivate expressing plasmid, an inducible vector for phaCAB over expression in Halomonas LS21 strain, CmR. Plasmid pBBR1MCS1-OriC-Pporin-phaCABLS was constructed as stated below; five parallel PCR reactions were performed to amplify each target DNA fragment, including phaC, phaB, phaA, OriC and porin promoter sequences, respectively (Table 2). In order to insert multiple copies of porin promoter into the expression vector, the following reactions were divided into three groups including OriC + porin promoter, phaB + porin promoter and phaA + porin promoter. In each group, equi-molar aliquots of every two adjacent DNA fragments (10 ng for each) mentioned above were mixed as templates to amplify fusion fragments, by overlap extension PCR  (primers shown in Table 2, overlap extension PCR part). Finally, another round of PCR reactions were performed to obtain Gibson assembly fragments, in which three fusion fragments would be needed as templates, namely, OriC + porin promoter , phaB + porin promoter and phaA + porin promoter, phaC sequence and pBBR1MCS1 vector backbone (primers shown in Table 2 used for Gibson assembly). For Gibson assembly , 0.1 pmol of each target DNA fragment of OriC-porin promoter fusion fragment, phaB-porin promoter fusion fragment, phaA-porin promoter fusion fragment and phaC fragment, and 0.05 pmoles of vector backbone were added to the reaction system, and 10 μl Gibson Assembly Master Mix (New England Biolabs, USA) was required up to 20 μl by adding deionized H2O. pmols = Weight in ng × 1 , 000 / bp × 650 daltons . The concentration of each fragment was measured using NanoDrop instrument (Thermo Scientific, USA) under absorbance at 260 nm. Incubated samples were placed in a thermocycler at 50°C for 60 minutes to allow assembling of the fragments. Transformable S17-1 competent E. coli cells were electroporated with 2 μl of the assembly reaction. Plasmid pBBR1MCS1-OriC-Pporin-phaCABLS was first transformed into E. coli S17-1 via the electroporation method using a Gene Pulser Xcell (Bio-rad, USA). Plasmid DNA was added to the chilled E. coli S17-1 cells just before treatment. The cells were exposed to single electrical pulses of 1.8 kV (corresponding to field strengths of 18 kV/cm) with pulse lengths of 5 ms. After electroporation, cells were diluted into 1 ml chilled LB medium and incubated at 37°C for 4 h to allow expression of the antibiotic resistance phenotype. The cells were re-suspended and incubated for 8 to 12 h at 37°C in 40-LB agar plates containing 25 mg/L chloromycetin. Plasmid transformation to H. campaniensis LS21 was conducted by conjugation between the above recombinant E. coli S17-1 and H. campaniensis LS21. The donor cells were incubated overnight while recipient ones were incubated in the presence of relevant antibiotics to reach an OD600 of 0.8. Cells were harvested at 5,000 g under 4°C for 10 minutes, then washed once with LB for E. coli S17-1 or 40-LB (40 g/L NaCl in LB) for H. campaniensis LS21, followed by mixing at a 2:1 ratio, subsequently the mixed cells were placed on 40-LB plates at 37°C for 8 h. Cells were re-suspended and incubated for 8 to 12 h at 37°C in 40-LB agar plates containing 25 mg/L chloromycetin. CDW was determined by centrifuging 40 ml of the culture samples at 10,000 g for 15 minutes. The pellets were washed twice with 100% alcohol to remove residual fatty acids, and dried at −75°C until a constant weight was obtained. Intracellular PHA contents were analyzed using a gas chromatograph (GC-2014, SHIMADZU, Japan) after methanolysis of lyophilized cells in chloroform . We collected 40 ml of culture from the fermentor, which was then centrifuged at 10,000 g for 15 minutes. The supernatant was taken, and 5 ml of supernatant each was used for residual substrate assays including oleic acid and protein, respectively; 10 ml supernatant was needed for starch concentration assays. Due to the insolubility of cellulose, the residual cellulose assays were performed using the precipitated biomass after the centrifugation. Total cellulose assay kits (Megazyme, Ireland) were used for analyzing total residual soluble and insoluble cellulose in the samples. Similarly, total starch assay kits (Megazyme, Ireland) were employed for residual starch-content studies. Residual free fatty acid concentrations of samples were quantitatively studied using QuantiChrom free acid kits from BioAssay Systems (USA) according to the manufacturer’s recommendations. Residual protein concentrations were measured using BCA protein assay kit (GenStar, China). The AZO-Xyloglucan cellulase kit and protazyme AK tablets (Megazyme, Ireland) were used for analyzing activities of cellulase and protease in the cultures, respectively. On the other hand, activities of lipase and amylase were quantified using the commercially available QuantiChrom assay lipase kit and QuantiChrom alpha-amylase assay kit from BioAssay Systems (USA) according to the manufacturer’s recommendations, respectively. To investigate the PHB accumulation ability of wild-type and recombinant H. campaniensis LS21 grown on mixed substrates (especially kitchen waste) consisting mostly of cellulose, starch, animal fats and proteins, a fed-continuous fermentation process was carried out. The whole process did not involve any sterilization of the fermentors, initial medium and feeding nutrients, or the whole piping system. Instead of the fresh water, artificial seawater was prepared and used during the fermentation process (Table 3). The mixed substrate medium was composed of straw cellulose extract liquid 200 ml/L (approximately 0.5 g/L cellulose), microcrystalline cellulose 2 g/L, oleic acid 40 ml/L, animal fat 5 g/L (lard), soluble starch 25 g/L, soya protein 2.5 g/L and casein 2.5 g/L. The composition is similar to much kitchen food waste. Wild-type and recombinant H. campaniensis LS21 were each cultured in two 500-ml shake flasks each containing 100 ml 40-LB medium at 37°C for 12 h, respectively: 200 ml of the flask cultures were inoculated into a 6-L fermenter (Bioflo 3000, NBS, USA). The initial working volume and the culture temperature were set at 3.5 L (containing 25 mg/L chloromycetin) and 37°C, respectively. A constant pH at 10 was maintained by automatic addition of 5 M NaOH. Agitation was started at 200 rpm and increased gradually to maintain dissolved oxygen (DO) of 30% air saturation: 40 ml of the culture broth was withdrawn every 12 h. On days 7 and 34, 500 ml artificial seawater was fed to each fermenter vessel within 6 h. On days 25 and 49, 2 L mixed substrates medium including 25 mg/L chloromycetin was fed to each vessel within 6 h.
Both wild-type and recombinant H. campaniensis LS21 cultures from the above fermentations without sterilization were collected, diluted and spread on the Petri plates containing the modified LB medium. The colonies grown on the agar plates were selected randomly for PCR amplification to test possible contaminating microorganisms. The PCR primers (listed in Table 4) were designed according to the whole genome sequence of H. campaniensis LS21. Seven sequences was found unique for H. campaniensis LS21 according to the BLAST results compared with other strains including Bacillus spp., E. coli and another moderate Halomonas sp., TD01. Based on those sequences, two pairs of specific test primers were designed to amplify the genome of H. campaniensis LS21 and the sizes of conserved target products were 1,708 bp and 1,942 bp, respectively. Cells of recombinant H. campaniensis LS21 sampled after 65 days of fermentation were grown on the agar plates. CFU were selected randomly for PCR amplification to test plasmid stability. The PCR primers (listed in Table 5) were designed according to the pBBRMCS1 plasmid backbone. A pair of specific test primers was designed to amplify pBBRMCS1 backbone with a size of conserved target products around 1,278 bp. Cells were harvested by centrifugation at 10,000 g for 10 minutes and then prepared for transmission electron microscope analysis as described . This collaborative research was financially supported by National Zhicheng Grants (grant number 2012BAD32B02 to JCC) and 973 Basic Research Fund (grant number 2012CB725201 to GQC and number 2012CB725204 to QW), as well as a grant from National Natural Science Foundation of China (grant number 31170099 to JCC). A Sino-Dutch collaborative project entitled “Sustainable biofuel production from organic waste via polyhydroxyalkanoates” also contributed to the project. We acknowledge Professor Zhang Chunting and Dr Gao Feng of Tianjin University for help in OriC sequence screening work. HTY and CL performed the experiments and wrote the manuscript, TY and XBC assisted the long-lasting fermentation studies, YLC and HTD conducted the proteomics analysis. QW and JCC were involved in the conceptual design. GQC designed and supervised this study. All authors read and approved the final manuscript.